At least 200 European airline websites are misleading the consumer, a study by the European Commission has found. Websites are failing to show taxes and charges, and refusing to advertise the lowest fare prominently, according to the report. The Commission has refused to name any airlines involved in order to give them time to improve their service. Last month, a Spanish watchdog said it had found misleading information on seven websites, including Ryanair's. The Commission, which is the executive arm of the European Union, could force offending websites to close next year if they fail to improve. Fifteen different national airline authorities across the EU took part in the exercise for one weekend at the end of September. They trawled through 400 websites, and found half were not complying in one way or other with EU law. When Spain's consumer rights watchdog conducted a similar study in October, it found faults on seven out of 12 airline sites, with it naming companies including Ryanair, Vueling, Iberia and Spanair. 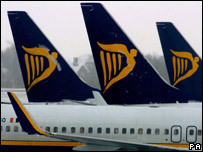 In response to the Commission's findings, Ryanair called on it to widen the investigation "to cover the real scandal of unfair fuel surcharge increases being levied by British Airways, Air France, KLM and Lufthansa," it said. The UK's Office of Fair Trading has already taken action against 13 airlines for leaving taxes, fuel fees and other charges off their advertised prices. The Commission's study found that Belgian airlines were the worst offenders, with 46 of the 48 Belgian websites surveyed breaking consumer guidelines. Meanwhile, Austria was the best performer, with none of the 20 Austrian airline websites judged to be misleading.